The MSC Cruises "ALL IN" Promotion is here! Enjoy a selection of house wines by the glass, Heineken beer, Miller Lite bottled beer, selected spirits and cocktails, non-alcoholic cocktails, soft drinks and fruit juices by the glass, bottled mineral water, classic hot drinks (espresso, cappuccino, caffe latte, hot tea) and coffee and chocolate delights. You can take advantage of this offer in all onboard bars, as well as the self-service buffet and restaurants, excluding specialty restaurants. Ideal for limited internet usage, the “Standard Internet ” package lets you access all social networks and chat APPs, check email and browse the web. Any Wi-Fi packages provided are available exclusively while aboard the ship, excluding MSC Cruises' private island, Ocean Cay MSC Marine Reserve. MSC Cruises - Memorial Day Cruise Deals 2018 Free Balcony Upgrade - Limited Time Offer! Book a Balcony stateroom at the same price as an Inside stateroom with the Bella Experience! Cruise to the Eastern and Western Caribbean on the brand new MSC Seaside. Enjoy exotic turquoise waters in some of our favorite Eastern Caribbean destinations including St. Maarten, Bahamas and Puerto Rico. If you are feeling adventurous islands of Jamaica, Mexico, and the Cayman Islands. 5% discount for all sailings - anytime, anywhere • Free membership in the NEW MSC Voyagers Club • Save an extra 5%-15% off on select voyages • Top-tier Black Card members enjoy added benefits like: We are excited to introduce our new and exclusive Status Match program where we will match your current program’s status. If you belong to a loyalty program with other travel brands (cruise lines & hotels), you will be able to sign up for the MSC Voyagers Club for FREE and receive a matching status card, guaranteeing you a 5% discount on any booking. Take advantage of their new Status Match program to discover the world of MSC Cruises, while enjoying all the perks and privileges you are used to. Destinations aboard MSC's first ever World Cruise are now on sale to the public! Destinations aboard MSC's first ever World Cruise are now on sale to the public! This is your chance to book the voyage of a lifetime, sailing in January 2019. Journey 119 days across six continents, experiencing 49 fascinating destinations in 32 countries, all on one magnificent ship. It's a voyage that goes to the most sought-after cities in all corners of the globe: from the Mediterranean across to the Americas, then through the Pacific Islands down to New Zealand and Australia, and onwards to Asia. Book yourself, or others on board the ultra-modern MSC Divina for a 3-Day Weekend Getaway this July and take advantage of all the benefits of the 2-for-1 sale and reduced deposit. The cruise may be short, but the entertainment is not –you will enjoy 20 hours of daily entertainment on board, including Broadway and Las Vegas-style theatrical performances, live music & dance-'til-dawn nightlife. Whatever your interests are, you will like the exciting games, music, and activities that are waiting to be discovered onboard. If you are traveling with kids, they'll even love our Mini & Juniors Clubs with dedicated areas for different age groups from infants to teenagers. They'll enjoy a mid-summer cruise escape to Paradise Island and the Grand Bahamas where they can snorkel & soak up the sun on countless beaches, take a leisurely bike ride, or adventure over to Atlantis Aquaventure for some indoor water park fun. MSC Cruises is proud to announce a unique partnership with the world leader in artistic entertainment, Cirque du Soleil. Starting in July 2017*, the next-generation ship, MSC Meraviglia, will become the first cruise ship ever to feature a custom Entertainment Lounge designed in collaboration with Cirque du Soleil to create a unique entertainment experience at sea. In addition, this long-term partnership will be extended to MSC Meraviglia’s three sister ships, which will be launched in 2019, 2020 and 2022. Six nights per week, Cirque du Soleil’s outstanding artists will deliver two unique shows – created exclusively for MSC Cruises – before audiences of 500 guests. *Rates are USD, per person, double occupancy, cruise-only valid for new retail bookings for U.S. and Canadian residents. Rates shown are for sailings on November 5, 12, 2017 aboard MSC Meraviglia. Government fees and taxes (GFT) of $49.73 per person for all sailing guests are additional. Offer is capacity-controlled, subject to availability, cannot be combined with any other discount or promotion and may be withdrawn without notice. MSC Cruises reserves the right to pass on any fuel surcharge without prior notice to all guests. MSC Cruises reserves the right to refuse to honor any prices/sailings that are erroneously printed or quoted. Other restrictions may apply. Ask for "Caribbean Super Deals" when booking. Ship's registry: Panama. 1. World-Class Entertainment: MSC Cruises is the only cruise line to offer 6 different Broadway-style production shows on a 7-night cruise with everything from exhilarating acrobatic feats and contortionism to riveting operas and tribute shows. Shows seen in the Pantheon Theater on MSC Divina receive a standing ovation every night. 2. Family-Friendly Activities: On board MSC Divina families will discover a variety of dedicated activities for all ages, in addition to a 4D theatre, F1 Simulator, mini-bowling alley, water slide, and unique LEGO Experience. 3. Health and Wellbeing Focus: The MSC Aurea Spa offers guests Balinese style massages as well as a state-of-the-art gym with personal trainers and yoga instructors. In addition, MSC Divina is the first cruise ship in the world to offer its passengers Aqua Cycling at sea – allowing guests to get a workout, while having fun and trying something different. 4. Stunning Décor: MSC Divina is one of the most elegantly decorated and stylish ships at sea, featuring Swarovski crystal staircases, glass elevators and European marble furnishes. 5. 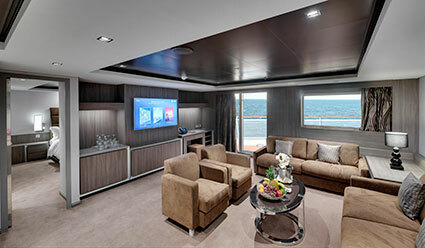 Exclusive MSC Yacht Club: With 69 suites, the MSC Yacht Club includes 24-hour concierge services, personal butlers, exclusive Top Sail Lounge and pool, and a private restaurant – allowing guests to enjoy a private luxury experience while still having access to the amenities of a larger ship.